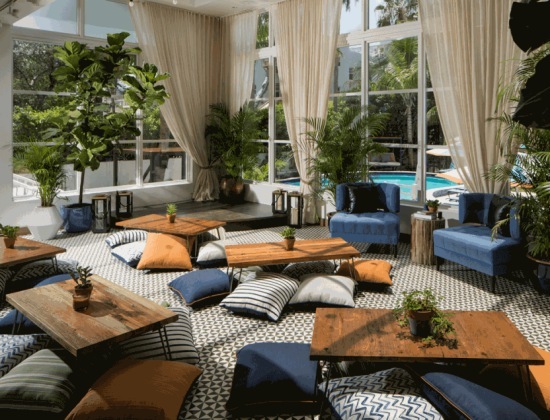 Generator, whose design-driven affordable luxury has disrupted hospitality across Europe, has opened its first US property, Generator Miami. An adrenalizing blend of high design, low price points, shared accommodations and magnetic social environments, Generator Miami has created a destination unlike anything in hotel-saturated South Florida. This brand, more hostel than hotel, appeals to laid-back millennials, and the company has chosen the perfect market to enter the US. Launched in 2011, Generator has already grown to 13 properties in European capitals like London, Amsterdam, Madrid, Paris, and Rome. Generator properties routinely win accolades as the most stylish and best-designed lodgings wherever they open. Each Generator mixes ultra comfortable private rooms with brilliantly designed shared accommodations, all at very accessible price points. Every Generator features free wi-fi, 24-hour reception, female-only accommodations, a travel shop, bar, and cafe. 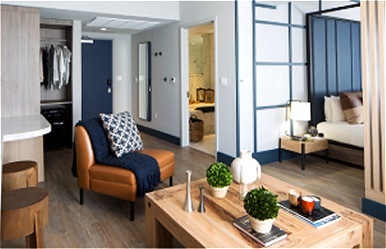 With 300 beds in 105 rooms, Generator Miami offers the brand’s signature mix of shared accommodations and private rooms, with a higher proportion of private rooms than at any of its European Generators. The property also showcases three carefully curated food and beverage venues with strong local roots; an array of spontaneous, anything-can-happen public spaces; and surprise-filled 24/7 programming from yoga classes to rap battles to mixology demos. A signature of any Generator property is an enviable location in the coolest district of a sought-after city. Generator Miami ups that game with an unbeatable South Beach spot on legendary Collins Avenue, one of America’s most iconic streets. 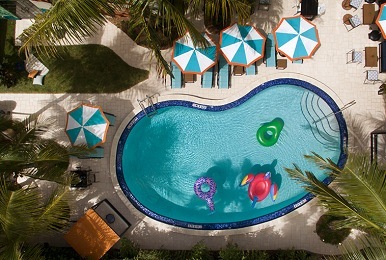 Just 100 feet from the beach and 15 minutes from Miami International Airport, Generator Miami lets guests hit the sand running in one of the world’s great seaside playgrounds. “For the first Generator in the United States, we couldn’t ask for a more perfect setting than Miami, considered home to one of the largest collections of design and style in the world,” said Generator CEO Alastair Thomann. ”For Generator, it’s also an opportunity to plant a flag in one of the world’s great leisure destinations, a city whose cultural energy, rich texture, legendary nightlife, and general sexiness fascinates our target group.” Generator boasts an astonishing 45% repeat-stay rate for guests; American travelers who’ve discovered the brand in Europe have been clamoring on social media for a Stateside opening, Thomann said. 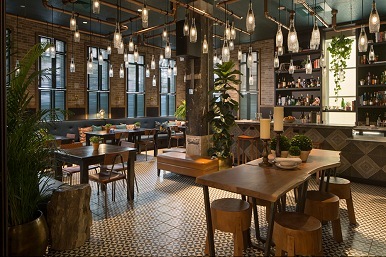 Generator’s also renowned for food and drink; Khayma at Generator Paris, Helter Skelter at Generator Hamburg, and Oosterbar at Generator Amsterdam have become as white-hot with locals as visitors. For Generator Miami, the brand has tapped an A-team of local culinary talent. Miami mixology star Gui Jaroschy, best known for his role launching Broken Shaker, has been named director of bar and restaurant concepts at Generator. A 12-year veteran of Miami Beach’s bar scene, Jaroschy is renowned for wildly creative cocktail programs rooted in classics. The property boasts three completely idiosyncratic food and beverage venues; each feels completely fresh while winking at Miami Beach’s glittery past and beach heritage. Chef Daniel Roy, a Florida native whose long Miami resume includes stints at 3030 Ocean and the Matador Room will run Generator Miami’s kitchen. A lively but laid-back lobby restaurant serves seasonal, composed plates using Florida produce and provisions. The concept: “Like visiting a cool couple’s home for drinks,” said Jaroschy. The mood continues outside, where a poolside bar will offer a new concept for Miami with signature cocktails, and Florida-made kombucha and wine. “Generator Miami’s invigorating and refreshing, and we wanted drinking to feel that way too,” he said. Art surrounds guests and visitors at Generator Miami. The main mural on the facade facing the swimming pool has been designed and painted by renowned South African artist Chris Auret, famed for his Mandela paintings and murals, street art, and styling of Afrika Burn, the Burning Man regional event in Africa. For rotating art throughout the year, Generator Miami will enlist a range of art partners, including the famed Amsterdam collective Kamp Horst, whose artwork in Generator Amsterdam has won worldwide acclaim. Generator Miami officially opened doors on September 21, and is currently accepting reservations. Opening rates will start at $20 for beds in shared accommodations and $95 for private rooms with ensuite bathrooms. 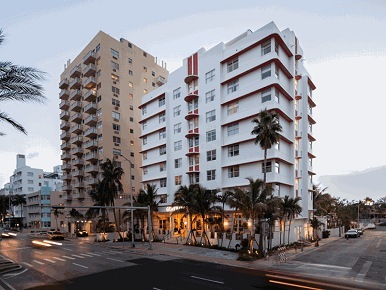 Generator Miami is located at 3120 Collins Ave., Miami Beach.